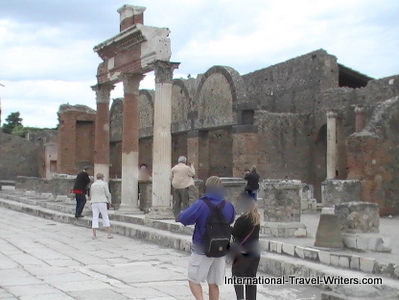 Pompei Lifestyles had the Forum which was a massive open space adorned with pillars and paved with stone. 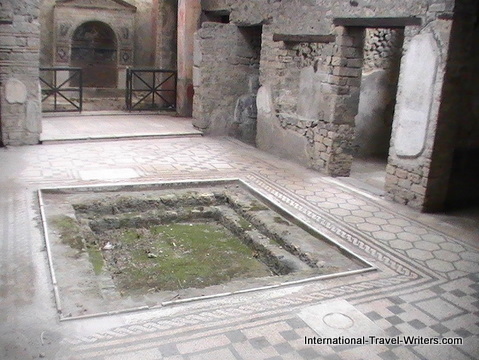 Pompei lifestyles were social and varied. The affluent had large homes with their own gardens and statues but for those that had more humble dwellings many areas were available. The Macellum was a huge marketplace with shops offering a variety of items pretty much like our shopping malls do today. It was a pleasant gathering place to meet up with friends and shop for daily needs. 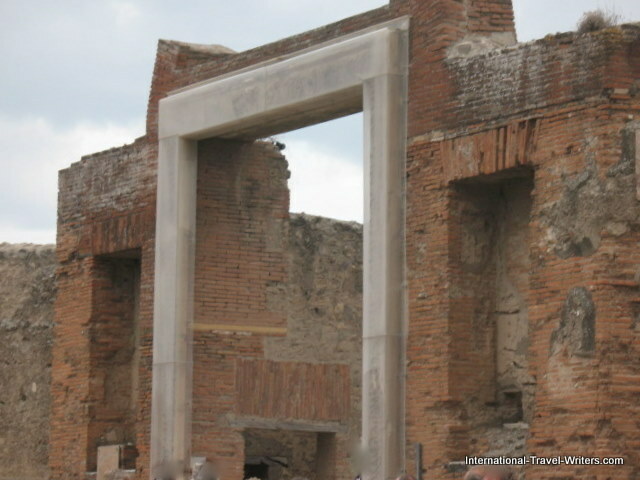 This impressive marble portal into the main Marcellum area survives today in pretty good shape even though many structures in the surrounding areas have disappeared. 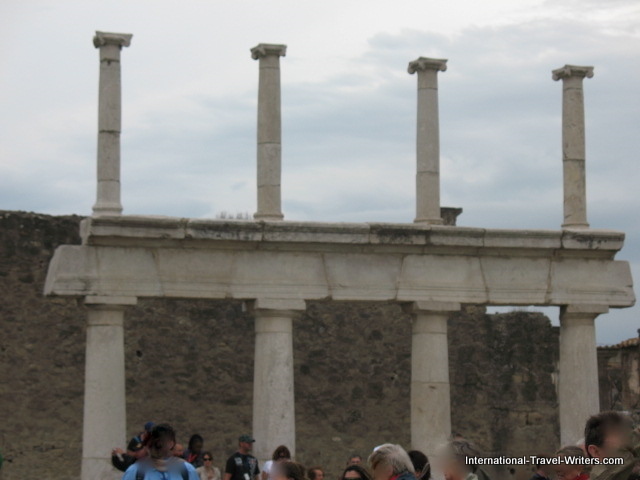 Pompei was a major trading port and merchants relied on having their products bought or traded. Along with this traffic came visitors with sexual needs so brothels were available for both the lifestyles of the residents and the foreigners passing through. Many visitors didn't speak the same language as the people of Pompei so a system was devised to post graphic depictions of the activities that were available. Those who couldn't speak the language, had only to point at what they wanted and then pay the fee for that choice. 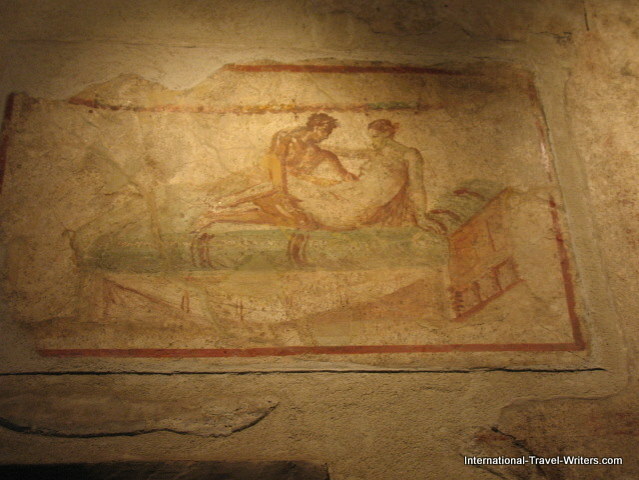 This photo is another fresco on the "menu wall" of the brothel. Traders from elsewhere could see the services offered. 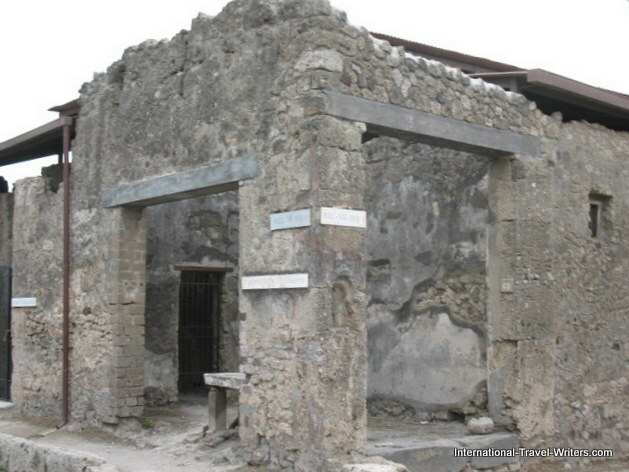 These wall menus were basically in the larger brothels and it is estimated that Pompei had about 25 brothels that were smaller than the main one. Pompei life was open and unashamed. The stones on the streets had a phallus engraved in them so that strangers who were unfamiliar with the city could find their way to the brothels. Sailors could follow the stone symbols from the port to the brothel without too much difficulty. Pompei lifestyles were varied depending upon the social class you were in. The average home was fairly small by our standards. 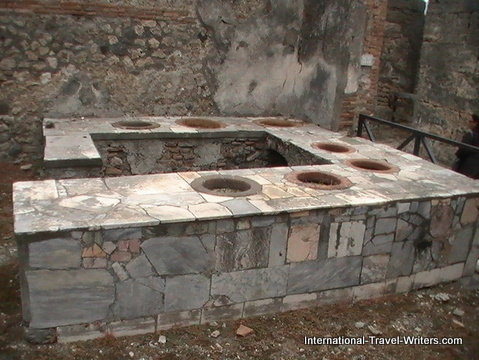 However, they did offer privacy and most had an oven that served as a heat source as well as a cooking device. We don't tend to think of such an ancient culture having the equivalent of fast food but many corners of the streets have these stands. They are to hold urns and other receptacles to offer foods, sweets, etc. This is an example of the more affluent dwelling. It has not only numerous rooms but an interior courtyard with what used to be a central garden or pool adornment area.